James E. Talmage is a very well known author in my religious community. He has written books that have become gospel classics (including Jesus the Christ and The Articles of Faith). He had a gift for explaining himself well in writing, with accuracy and insight. A new book called A Beginner's Guide to Talmage by Calvin R. Stephens has been published by Deseret Book. I've had a chance to look through a copy of it, and I think it's great! Calvin writes about Talmage in the beginning of the book, in a small "life sketch" section, and shares excerpts from many of his writings, organized into subject matter. 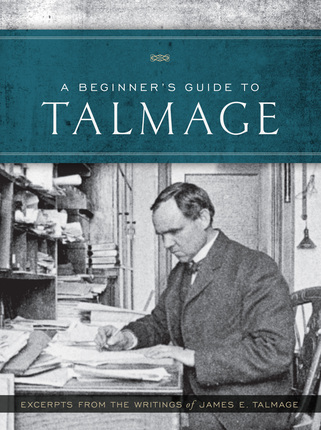 Whether you have been wanting to read Talmage's writings but haven't felt prepared to tackle it all, or you want an easy way to find that quote that you read once in one of his books, this will be a great resource! I like that you can study by topic, and everything is clearly referenced, so that you can refer back to the original work if you want to read more. It's interesting to read through it, bringing different themes to mind- a great way to start off on thematic doctrinal study. as a paperback book or as an ebook.